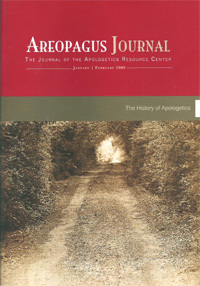 Areopagus Journal is published bimonthly by the Apologetics Resource Center, a nonprofit organization dedicated to equipping Christians with a culturally relevant apologetic, enabling them to have a deeper level of personal faith, contend for that faith, and to enter arenas of resistance and reclaim ground lost to skepticism, secularism, and other alien philosophies. A one-year, bi-monthly subscription to Areopagus Journal is $30 (Canadian $35). All contributions to the Apologetics Resource Center are tax deductible. “Augustine: Christian Champion of the First Millennium” by Kenneth D. Boa, D.Phil. and Robert M. Bowman, Jr.
You are currently browsing the SUMMA PHILOSOPHIAE blog archives for the day Monday, June 23rd, 2008.